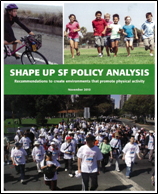 We are excited to share with you our latest project, the Shape Up SF Policy Analysis. This is a translation of a research-heavy report produced by the San Francisco Department of Public Health, with recommendations to create environments that promote physical activities. Thanks to DataCenter, Shape Up is a concise, accessible and useful document that policymakers and organizations will use to create a healthier San Francisco Bay Area community. More information about the Shape UP San Francisco Coalition.